We've added a new feature to TaxJar to help you determine if you are over or under collecting sales tax. 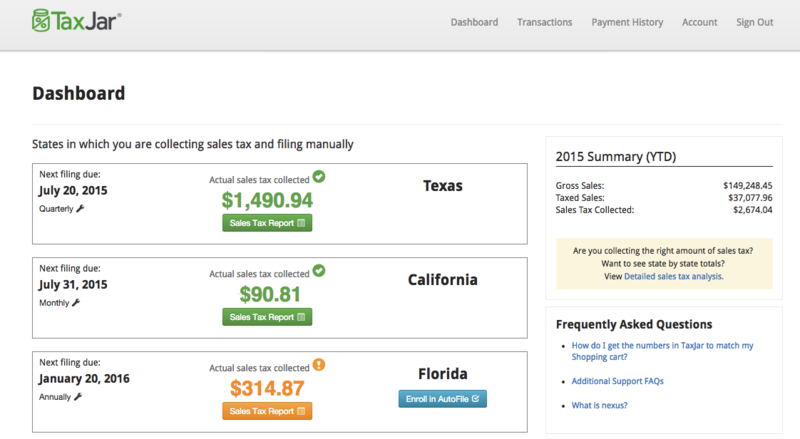 You'll see a new look on the TaxJar dashboard, and a new "Expected Sales Tax Due Report" in each individual state report. We've answered some common questions about this new feature below. Q: What's new on the TaxJar dashboard? The states in yellow are states where we suspect you might be over or under-collecting sales tax. If you see yellow on your dashboard, don't panic! It doesn't necessarily mean there is a problem with your amount of sales tax collected, and there are a few scenarios (detailed below) why you may see yellow even if you are collecting correctly. This report is a guideline to help you ensure you are collecting the right amount of sales tax. If you see a yellow state on your dashboard, you can click on the state to drill down and see where the problem might be on the "Expected Sales Tax Due" report. Q: What is the "Expected Sales Tax Due" Report? As you can see, the "Expected Sales Tax Due" report gives you very detailed information on how much sales tax you've collected at the state and local district level. If there's a problem, this level of detail will help you determine where the error lies. Q: Why are my "Actual Sales Tax Collected" and "Estimated Sales Tax Due" report amounts different? The Actual Sales Tax Collected report shows you data based on the taxes you have actually collected. The Expected Sales Tax Due is an estimate of what we think you may owe based on your sales totals. If you haven’t been collecting taxes, this report can help give you an idea of what you should have collected or what you should be collecting. Q: My expected sales tax due seems off in Arizona, Pennsylvania, Tennessee, Texas or Virginia. Why is this? If your expected sales tax due seems off in these states it's likely because you have not set up an address on the "Account" screen. Make sure you've set up an address by logging into TaxJar, clicking "Account" then entering an address under your "Business Profile." Q: I'm already collecting taxes. Why does my Dashboard and Expected Report say I'm not collecting enough? If you sell on Amazon, we address more specific reasons you may be overcollecting and undercollecting here. You aren’t collecting sales tax through all platforms - Double check that you have sales tax collection set up through all the shopping carts and marketplaces you sell on. You can find out more about setting up sales tax collection on common eCommerce channels here. I make tax exempt sales. Why does my Dashboard and Expected Report say I should have collected tax on those orders? Because your cart doesn't send additional detail to explain why an order was untaxed, TaxJar can’t automatically recognize when an item is tax exempt, but we have features you can use to classify your sales that fall into these categories. Once you categorize those sales, the Expected Report won't view those transactions as taxable. You sell wholesale orders or you sell orders to a tax exempt entity, such as a government entity or a charitable organization. If that's the case, you can exclude those orders from the Expected Sales Tax Due calculation by marking those individual orders as exempt as we describe here. You sell non-taxable (exempt) or reduced tax items. If you products that fall into tax exempt or reduced tax categories*, you can tell TaxJar more about which items are exempt so both the Expected Report (and AutoFile) will recognize which sales should be exempt. If your products fall into tax exempt or reduced tax categories,* you can tell TaxJar more about which items are exempt so both the Expected Report (and AutoFile) will recognize which sales should be exempt. If you make sales on platforms outside of Amazon, Shopify and SmartCalcs and you sell exempt or reduced tax items, and you have tax collection set up correctly in your cart, we recommend that you stick with the totals in the "Actual Sales Tax Collected" Report for the time being. Q: Are refunds included in the Adjustments/Presumed exempt totals? In some state Reports, a refund from a previous period can be reported in the next upcoming return. This effectively reduces the gross sales total for the period when the refund took place, which would also reduce the amount of taxes owed during the time frame as well. In other state Reports, if a return has already been filed, and a refund takes place after the return is filed, the state may require you to file an amended return to get a refund for a return that took place in a previous period, rather than deduction those returns from the next filing period's return. We discuss this in more detail here in this blog post. The adjustments/presumed exempt amounts in our local reports reflect shipping (if shipping is not taxable in the state) and any transactions where you have not not collected sales tax. Q: Whoa! I see a lot of states on my dashboard. Do I really have to collect sales tax in all these states? You would only need to collect in the states where you have sales tax nexus. Q: How do I know in which states Amazon gives me sales tax nexus? Amazon FBA sellers generally have sales tax nexus in states where Amazon stores their inventory in an Amazon Fulfillment Center. 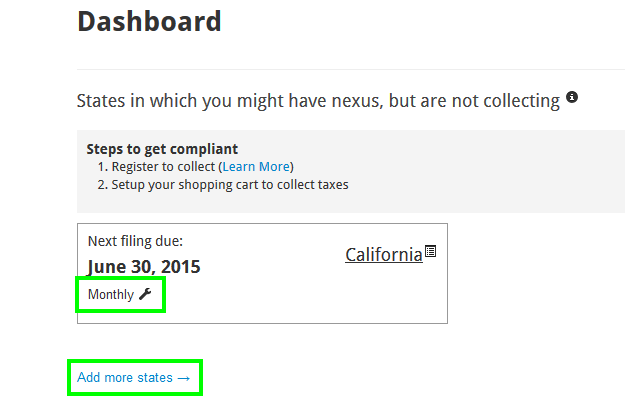 TaxJar will detect the states where you have nexus because of FBA inventory and automatically add them to your Dashboard with an Amazon badge next to the state name. Q: How do I remove states where I don't have nexus? To get rid of any states from your TaxJar Dashboard, click the wrench under that state name to edit the settings for that state. 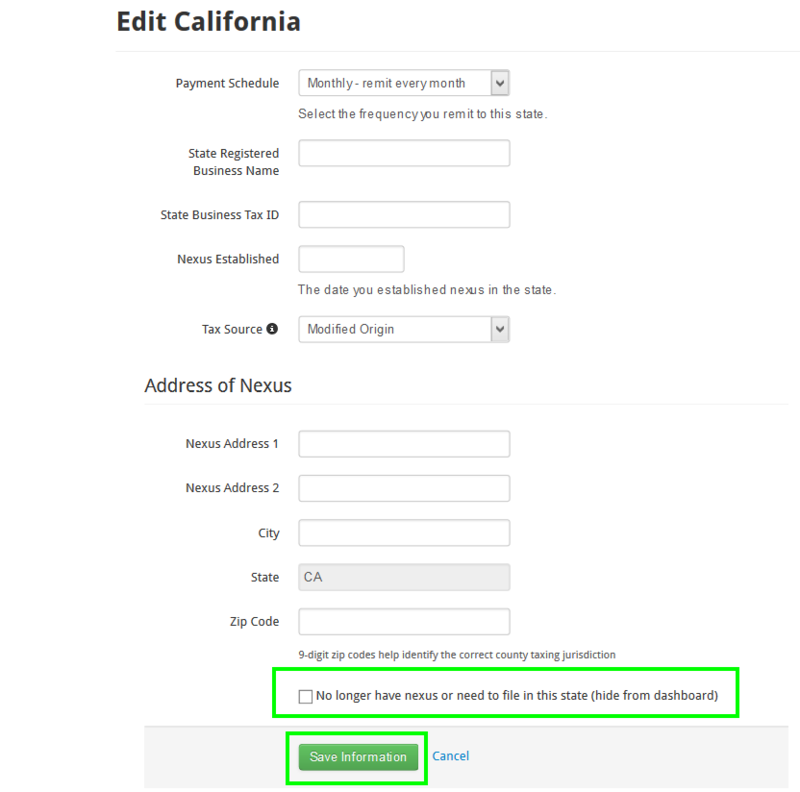 On the next page, click on the checkbox next to 'No longer have nexus or need to file in this state (hide from dashboard)'. The state will be gone from the dashboard.